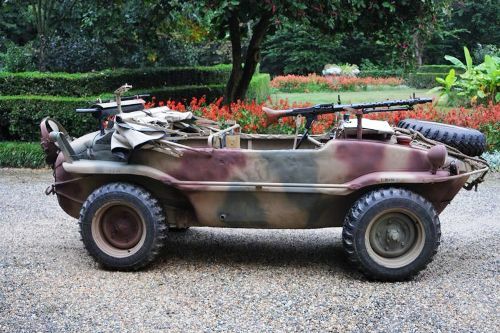 Exactly 15,125 VW Type 166 better known as Schwimmwagens were manufactured during World War II. At the conclusion of the war, all the vehicles that could be found were crushed or used for target practice by the Allied Forces. Consequently only 125 or so examples survive today. 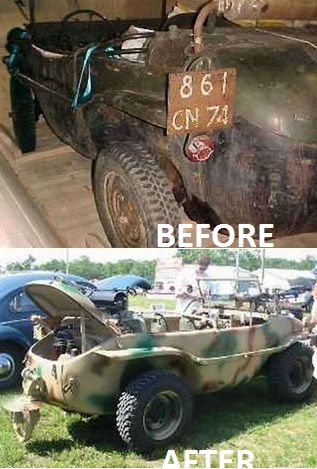 I bought my first Schwimmwagen in the mid 70s from a gentleman who worked as a translator for the United Nations. Actually, I didn?t buy it. I traded him the car for a harpsichord. The vehicle fascinated me. Being a car collector, it was a most unusual find and I enjoyed it. 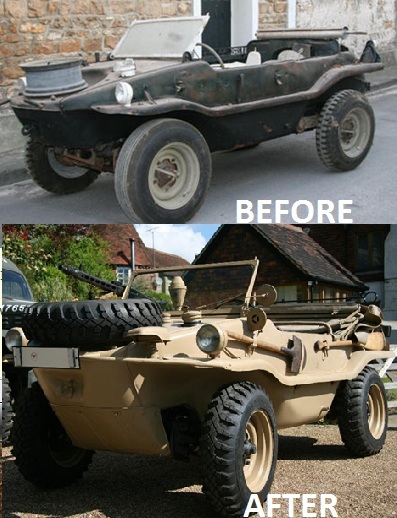 I kept the car for a while and then sold it to a gentleman in Washington , DC who had a second Schwimmwagen. He was very ill and he looked at them out the window of his room. At that time of his death his widow sold them both. One went to Florida and the other to Toronto . 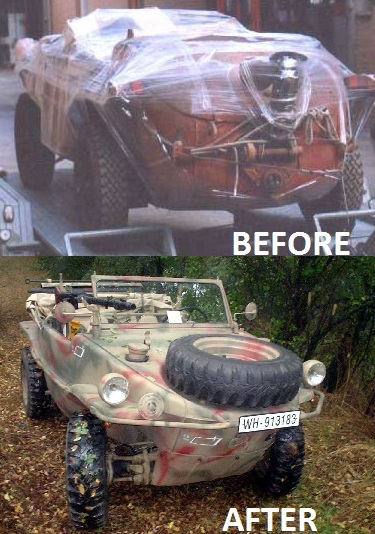 I do not know which one was my first Schwimmwagen and I always regretted selling the car. The good news is that the person from whom I bought the first Schwimmwagen owned two of them. One being the car that I bought 30 years ago in the US and the other one that was in storage on his farm in the French Alps. He had left it sitting in the barn when he drove it for the last time in 1959. It had been his everyday driver up to that point until his wife refused to ride in it any longer. He had not started it since that day he parked it 40 years ago and he had not seen it for the past many years. I remained good friends with the gentleman who is now quickly approaching 90 years of age. When I saw him in the summer of 2001, he told me that some Frenchmen had found the car and were attempting to buy it but didn?t have adequate funds to do so but they were working on it. I asked him how much he wanted for it and agreed to pay him his asking price. Even though we are good friends, he said he would do nothing to help me get the car and I was on my own with the purchase and delivery to the US . I agreed and worked to find a shipper to pick up the car and deliver it to me in the US . Eddie Daepp of Car Logistics in Switzerland was recommended and I hired him to move the car. The beginning of December 2001, a car carrier was sent to pick up the car high in the Alps before the snows came and the roads became impassable. The owner of the car, who now lives in Geneva , had not been to his farm for many years but he did agree to accompany the trucker. When they arrived at the car, he took the key out of his pocket where he said it had been for 40 years. He attempted to start the car but obviously the battery had long gone dead and he commented "the battery must be flat" when the car would not start. The car was flatbedded to Switzerland and crated before being transported to Rotterdam for the ocean part of the journey. Two months after it was picked up on the farm in France it arrived in Port Elizabeth ,New Jersey . A-1 Towing of Canton Connecticut picked up the crated car on a snowy day in February. After bribing the person on the docks who infomed me he would not be able to give me the car until the snow stopped unless I was prepared to buy him breakfast, we loaded up the car and were on our way home. The shipping company would not allow me to open the box on their premises so we delivered the large crate to Connecticut and cut it open with a chain saw. When the crate was open, I saw the car for the first time. I was very surprised as to the condition of the car. It was rust free and reasonably complete (or so I thought at the time). The car had been driven daily by my friend and prior to that it was the daily driver of the "young hippy type" he bought it from. It had been modified to meet the requirements for a French registration after the war. I also think it had been used as a tractor at some point as the suspension had been modified to carry a lot more weight and the interior of the car was badly damaged from carrying cargo. The seats were missing and had been replaced with a bench seat. The dash was missing. The windshield had been widened and changed for better weather protection. French headlights, horn, and many other items had been changed and the propeller drive lost when the original engine was removed and replaced with a correct engine but not the original engine. Also all traces of the car?s military history had been removed. I cleaned the car and delivered it to Bob?s Foreign Car in New Hartford, Ct. After rebuilding the carb, adjusting the valves and putting some fresh gas in it, Bob had the car running in a very short time and he drove it around the block. It ran very well and the original cable brakes worked perfectly. Not having any idea what was correct and what was incorrect with the car I began doing research as to how to begin the restoration. 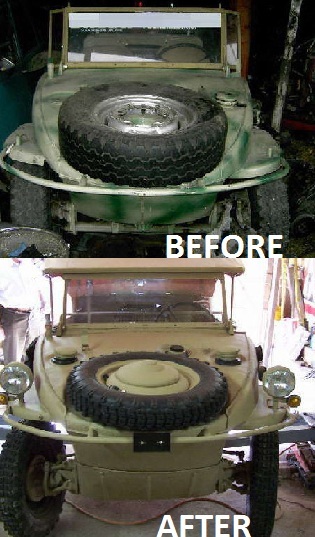 I talked to Chuck Pisconski from Vintage VW who said there was a person in Michigan who restored Schwimmwagens and Kubelwagens, but he could not remember his name. He ultimately found the information and I called Dave Crompton, who is a wonderful person and has become a very good friend. I booked airline reservations and flew to Michigan to spend a few days at Dave?s shop as there were several Schwimmwagens there undergoing restoration. I photographed them extensively so I now had pictures of every nut and bolt on the cars. I also looked at the correct parts for the car and realized how much of my car was incorrect. I bought many of the parts that I knew I needed. Some of these I brought back on the plane with me and the rest Dave UPSed to me over the next few weeks. 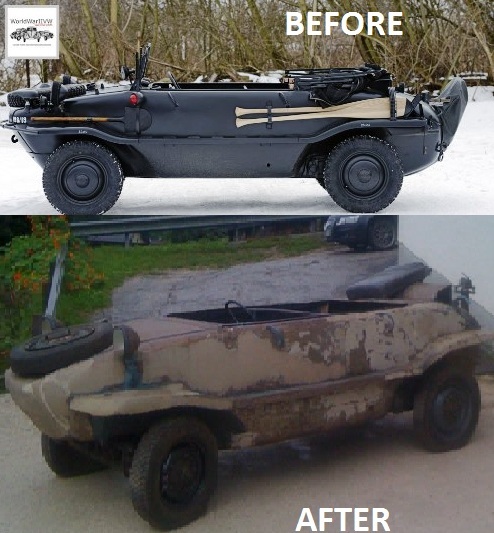 When the Schwimmwagen arrived in Connecticut , the car looked as if it had been parked in the middle of a golf driving range and used as a target for many years. It was dented from front to back and the back of the car was twisted and torn. The front of the car had been torn off at some point and the metal replaced with a flat piece of steel. The car was totally disassembled and sand blasted. It took several months for Wes Zadora at Bob?s Auto Body to beat out the dents and get the car reasonably straight. After the interior was painted the original tan, the car was moved to the mechanical shop to begin that stage of the restoration. I was continually finding and buying parts. Dave Crompton was able to provide many of the things that I needed and I had a package arriving from him almost daily. I also found parts that he did not have from a large number of people in Europe . Other Schwimmwagen owner?s were very quick to help. If I had a question I would email someone and I would get an immediate answer and photographs to show what was correct. Dale Taylor from Ohio was a great resource and I have extensive photographs showing his car which was restored a few years ago. . After I had successfully located the mechanical parts, I then concentrated on finding the add on parts that originally came with the car. I bid on many items that appeared on German eBay. The Schwimmwagen carries a machine gun mount behind the rear seats. I was the high bidder on the item and Wolfgang Nertinger, who listed the item has become a great friend even though I have not met him as of yet. He has provided me with parts and information that were not available in this country. 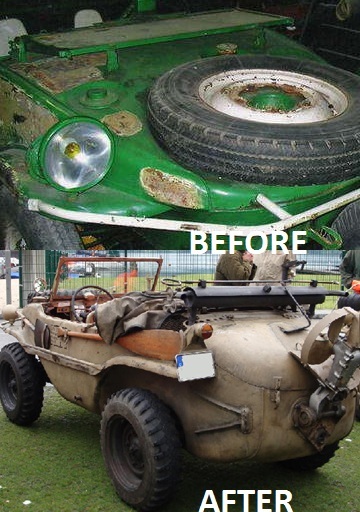 The car was finally mechanically completed on June 13th and it received the green and brown camouflage paint job. The following day it was driven to the Harwinton VW show and competed in the concours where it won 1st place in class. It has since been at two more shows where it also won. It is now being driven on a regular basis. In August, 2002 I attended the 14th annual Kubel Korp meeting in Ohio and once again learned many things about the vehicle that I did not know before. I also went for my first Schwimmwagen ride in the water. I attended the meet again this August still without the car as there are some mechanical issues that have to be resolved. These will be addressed shortly and the car will be ready to drive and show. I have mixed emotions about putting it in the water. I have no doubt that it will float and be fun but the car has been restored to a very high standard and I don?t want to risk damaging it. I have kept the previous owner updated on the restoration of the car and he did come from Switzerland to see it half way through the restoration. In late 2007, a schwimm was advertised on Bart’s inestimable website, vw166.com. At this point, I had been looking for a schwimm for almost 2 years and had reconciled myself to the fact that it was unlikely I would ever get one, especially as prices seemed to be rapidly rising out of my reach! 15410 was obviously a restoration project but from the photos seemed complete. The sale was to be made to the highest bidder and so I lodged my bid and was surprised to find it was the highest. At this point however, the owner was not quite ready to sell and so a number of months passed until just before Easter 2008 when I received an email telling me that 15410 was mine and could be collected!! I could not stop smiling. Cash was transferred, trailer rented and ferries booked. Myself, a friend, my daughter and her friend made the journey from UK to just south of Paris where 15410 lived. As we approached the location, I began to feel nervous, I had at this point only seen a few photos of the car and so did not know really what to expect. We arrived at our destination et voila! In a barn, we found 15410 where she had lived for the past 20 years. Unfortunately, the owner was unable to share any history of 15410 with me save for the fact he had owned her for 20 years and in that time, it seemed, had been unable to complete her restoration. The car seemed fairly original and unrestored. The body appeared to be complete and in reasonable condition, there being some obvious rust problems but nothing too serious. Whilst relatively complete, some ‘cosmetic’ parts were missing, e.g. couple of seats, gearbox cover, roof and frame etc. However, all the major components seemed to be present – body, windscreen, gearbox, engine, propeller unit. - the fact she was mine! 400 miles later, she was at her new home which she will now share with new friends! 1. Maintain the momentum – it is easy to push projects to the back of the garage and forget. So I have set myself a target. Normandy 2009. 2. Keep notes during tear down – I always say this, I never do it. This time is different as the reference material is not as freely available as for other vehicles like Jeeps. Whilst the driver side dashboard bracket is present and seems original, there is no Fahrstelling nummer stamped into it. 1. Below the waterline, the driver side is a mass of welded on patches to cover the pinhole perforations revealed by the sandblasting. This patching has not been done in a professional way, it is simply big plates of metal slapped on and arc welded in place. On the positive side, we can now see what needs to be done! Replacement panels ordered from a variety of sources. 15410 is now at the body shop where work will commence in the next couple of weeks on restoration retaining as much of the original metal work as possible. It has been suggested that given the high aufbau and green paint, this could be one of the schwimms assembled and used after the war by the British Army. Photos of these schwimms have all of the same body details as mine and the green paint inside the engine bay is perhaps further evidence. A known British assembled schwimm has an aufbau very close to mine. It was also suggested that the absence of the stamped fahrstelling could have been because those assembled by the British were not ‘production line’ models and so might not have received a production fahrstelling nummer. Vince has challenged me to rebuild 15410 in British army configuration, i.e. paint her dark green…….but I think I prefer the sand colour……. After a "few" years, in 2002, one of my friends gave me the telephone number of this boy. His father, the owner of the schwimmwagen, died 5 or 6 years before. His son wanted to sell the vehicle. I went immediatly to his home and found the schwimmwagen in a big wooden box, below a roof of his little industry. It was still possible to see the bullet holes, in the front, left side and on the rear/engine part. When I obtained a good agreement, my schwimm adventure was starting ! With the vehicle (with 15" VW weels) I obtained 5 wide 16" rim + a lot of spare parts of one other schwimmwagen, wich was dismanteled a lot of years ago. All the pieces of the second schwimm were in "panzergrau"...... When I was rebuiling the vehicle, I found a newspaper inside the air intake manifold, dated 1972. 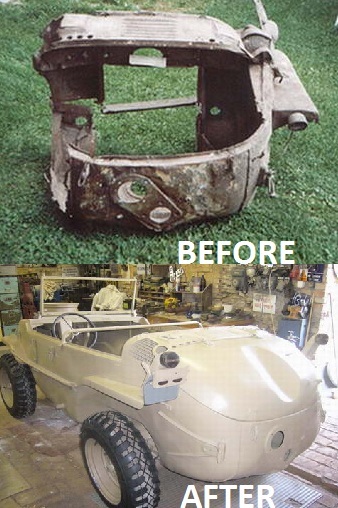 The body was rust free, inside there was still a lot of original sand color paint. The only problem was to find the missing body parts, Trommel holder, MG support, barrel support, windshield (the old owner wished to use a wide Kübelwagen windschield, which I still have) canvas cover and support, all rubber part etc. etc. Having found the vehicle in Italy, my car came probably from the Fire Department or Campo ARAR (there were a lot of Campi ARAR after the war). They were collecting all abandoned military vehicles around Italy, to sell them for private use or to be "re enlisted" in the Army). Ein Bild aus Italien: Erste Wasserfahrt nach der Restaurierung! First time in the water! Picture from Italy. La première fois dans l'eau, elle ne coule pas! Photo d'Italie. Read more about Erste Wasserfahrt! 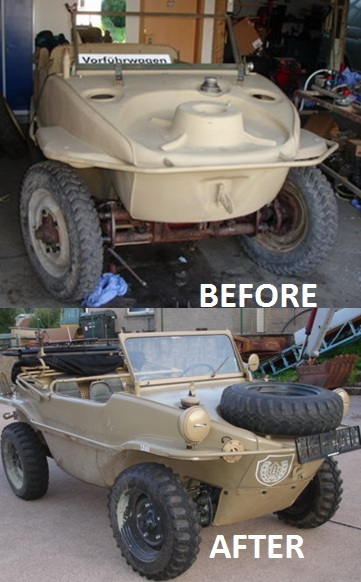 One of our Italian readers happily reported completion of the restoration of his VW166 with number 7-004775. We congratulate him on the result!